Ladyfingers,okra or bhindi is a very popular vegetable in India. Its cooked dry, used in sambhars, made with tomatoes or with a gravy, depending on the type of cuisine. Gujaratis normally cook it dry. The Japanese use okra to make tempura. In Malaysia its stuffed with fish paste and in other parts of the world, the slime helps to thicken a soup. It is a slimy vegetable, which is reduced when cooked dry. Most kids love bhindi. Nikil my son loves stuffed bhindi. Whenever we visit hubby’s aunt (foi), she always gives me some vegetable that has been either grown at home or at their office yard. Right from brinjals, doodhi to spinach. This time round she gave me these fresh young tender ladyfingers. The first thing I could think of to make was stuffed bhinda and I had a bit of stuffing in the fridge. I usually wipe the ladyfngers with a damp cloth to avoid the vegetable getting all slimy.If the ladyfingers are dirty, then wash it in a colander and dry out on a cloth before you use it. As for the stuffing, there are so many varieties, again depending on the different regions of India. Some are made with chickpea flour, some with coconut and peanut, some are stuffed with only dry spice powders, some are stuffed with poppy seed paste. The varieties are endless. I’ve used a stuffing that I learnt from my mother in law and everyone in the family enjoys this style stuffed bhindi. We usually make it with aamras and khadi or when we make shrikhand. However, now that its just hubby and me at home, I usually serve it with a dal and roti. The tip to keeping the bhindi as green as possible is to add turmeric powder to the oil before you add the stuffed bhindi and to cook them on slow heat without a lid. We are lucky that we get really good quality bhindi in Kenya. They cook pretty fast and have a sweetish taste. I find that bhindis take a longer time to cook in India and they are almost tasteless. Grind the roasted sesame seeds into a coarse powder. Heat oil in a wide pan or wok over low heat. Add mustard seeds, carom seeds and cumin seeds. Add chickpea flour and roast it over low heat till it becomes light pinkish in flour. Add the coarse peanut powder and sesame seeds. Stir fry for a few seconds. Add ginger and chili paste. Stir fry for a few seconds, make sure you don’t burn the flour. Add turmeric, red chili and chana jiru powders. Mix well. Add salt, sugar and lemon juice. Mix well. Take the pan off the heat. Add chopped coriander leaves and mix well. Let the stuffing cool down. Wipe the bhindi with a damp cloth. Tim the top off. Make a slit in each bhindi in the middle lengthwise. Avoid slitting the top and bottom bit. Stuff the bhindi with the stuffing. Heat the oil in a frying pan. When it is hot add the seeds. When they begin to splutter, add the hing and turmeric powder. Gently place the stuffed bhindi into the pan. Cook the bhindi over low flame for 10 minutes or until nearly done. Shake the pan occasionally. Add the salt and let the bhindi cook till done. Garnish with chopped fresh coriander and serve with roti. Wash the bhindis and let them dry on a cloth overnight. Adding the salt to the bhindis while cooking will make them slimy. So add at the end. Cut the bhindis into thick slices and cook dry in oil and spices. When done, add the salt and stuffing masala for a slight variation. Remember to add turmeric powder to the tempering. This helps the bhindi retain its green colour. Store any leftover stuffing mixture in the freezer. Use it to sprinkle on dry bhindi sabji or any other sabji. Add the required amount of oil to the stuffing. If you use less, the stuffing will not hold too well when stuffed in the bhindi. We had Bhinda Nu Bharela shaak yesterday.Thanks to you,I finally learnt how to prepare it.It tasted awesome! Love bharela bhinda and thi stuffing sounds so falavourful and yum, the coarse peanuts would give the dish an awsome texture for sure, lovely share. Thank you so much Soma, my mother in law’s recipe. The stuffed bhindis are looking so cute….all lined up. The stuffing looks very nice. The bharela bhinda looks delicious. We make the filling with only dry spices. I loved the addition of crunchy peanuts here. Its been a while i had stuffed bhindis.. Super tempting stuffed bhindis there Mayuri, i can finish that plate in a jiffy.. Irresistible they are. Thanks Priya, can you imagine the amount I had to make when the whole family was together as my family too loves it. 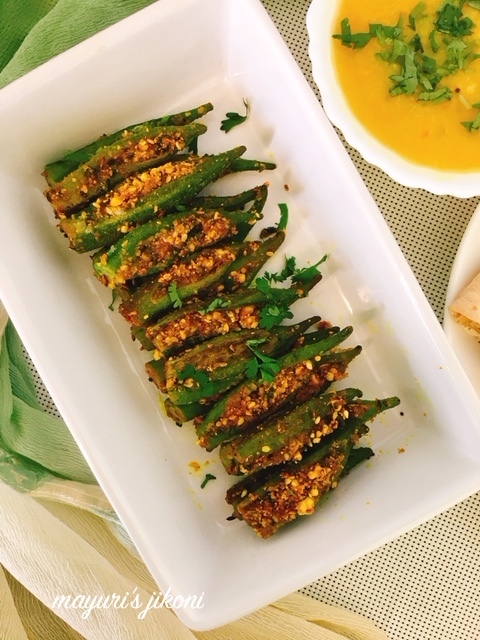 Love bhindi and you are right, getting tender bhindis always depends upon luck; this dish looks so scrumptious and delicious! Love all the spices and flavors you have added! Awesome share! We love bharva bhindi and it is regular affair at my place. Your stuffing sounds full of flavors di ! Stuffed bhindi looks so delicious. Your tips are very helpful to get the perfect final product. For me getting fresh and tender bhindi is very rare now a days. Clicks are beautiful as always. Stuffed bhindi I really love them but not my DH, so do not make it .your bhindi looks so nice and yum. Would love to have some with phulkas and hot kadhi. Thanks Renu, a huge favorite in our family including the kids. Irresistable recipe. I love the way you hv created the filling and perfect stacks. I love stuffed bhindi. And these are looking super tempting. Bookmaking it to try soon. Stuffing sounds spicy and delicious. Thank you so much Sujata… and please do try out the recipe.